Shrink bundling machinery relates to any sealers, tunnels, or add-ons made for shrink bundling applications. Bundling machinery is made to have stronger seals and produce more heat than standard retail shrink wrapping. Most product cases used with shrink bundling weigh several pounds. 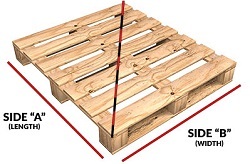 A single wound (flat) polyethylene shrink film is used to hold and secure multiple products together. Thicknesses vary from 2 mil up to 6 mils. Shrink bundling is used for packaging cases of drinks, canned goods, securing heavy products, and more. The two primary pieces of shrink bundling machinery are the bundler and shrink tunnel. 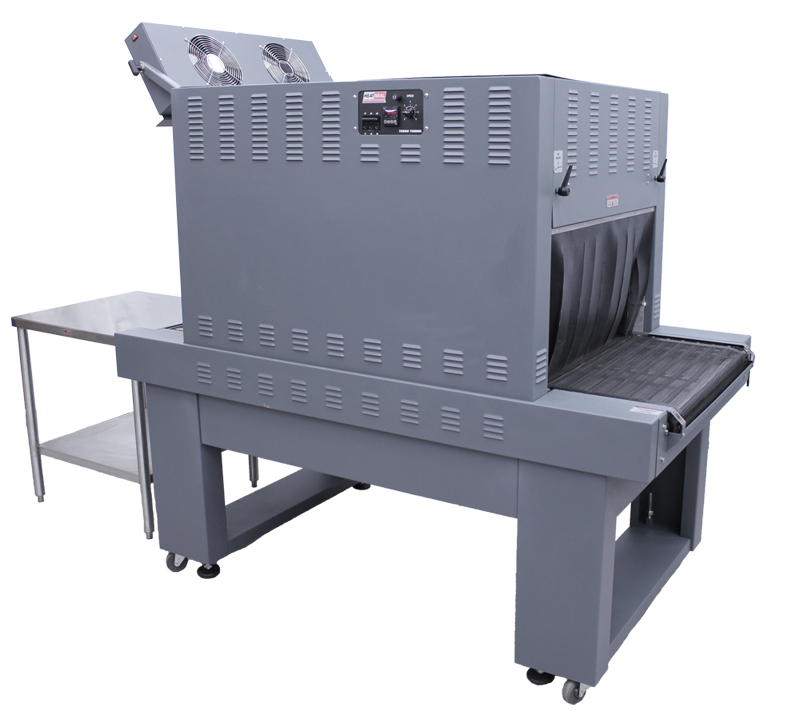 The sealer or shrink bundler uses a heated sealing bar to seal and cut the film for each package being wrapped. Shrink bundling sealers have more durable sealing blades than standard shrink sealers. The preferred sealing blade for shrink bundling are hot knife sealers. A hot knife sealer can last years, much different than wire sealers common in retail shrink wrapping. Heat tunnels used for shrink bundling have larger heater banks, blower motors, and external cooling fans. Shrink bundling film shrinks as it cools, the external cooling fans help to speed up the cooling process. Shrink bundling tunnels also have nylon or a non-stick conveyor belt going through them. The sealers and tunnels used for shrink bundling are built to handle higher temperatures. Thicker shrink bundling film requires more heat to shrink and seal. Spending the extra money on machinery built for bundling is well worth the investment. Shrink bundlers are used with two single wound (flat) film rolls to wrap and unitize multiple products together. 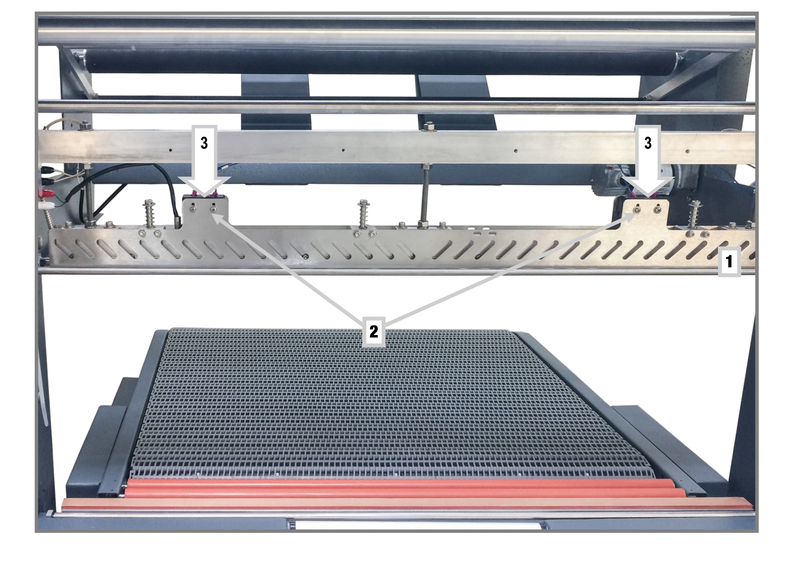 Shrink bundlers use a heated sealing bar to seal and cut the single wound bundling film. The single seal creates two open sides on each end of the product. The open ends are often referred to as bulls-eyes. A shrink bundler encloses the product(s) in the shrink film, but heat still needs to be applied. Some shrink bundlers are all-in-one systems that offer the bundler and heat tunnel as one unit. Other bundlers are only the bundle sealers and require a shrink tunnel to heat the film. Shrink bundlers have large openings for stacked cases, bottles, and other heavy products. The air operated opening closes to make a seal after the product passes. The seals are thicker and stronger than other wire shrink sealers. After the seal is complete, a conveyor transports the product(s) into the shrink tunnel. The conveyor belt features stronger motors for moving heavier products. All shrink bundlers should feature an easily accessible E-stop and additional safety features to maintain workplace safety standards. Shrink bundling tunnels are made to handle more heat and heavier products than standard shrink tunnels. Thicker shrink wrapping materials require longer tunnel dwell times at higher temperatures. Shrink bundling tunnels need larger heater banks to maintain hotter temperatures. Standard heat tunnels come with 7-10 kilowatt heaters, while bundling tunnels come with larger 12-15 kilowatt heaters to produce more heat. Inside recirculating shrink tunnels, blowers are used to evenly distribute the heat from the heater banks. In standard shrink tunnels can offer anywhere from 1 – 3 blowers depending on the size of the tunnel. Due to the size of most bundling tunnels, a minimum of at least 3 blowers are used. The multiple blowers can be adjusted to reach the right air velocity as the products continue through the conveyor. One of the last differences between shrink bundling tunnels and retail shrink tunnels is the size. Due to the heating and cooling time needed to properly shrink a polyethylene bundling film, the tunnels have to be large. Most bundling tunnels have a 12” – 20” height opening to fit larger bottles and cased products. The length of bundling tunnels are longer than smaller retail tunnels. The thicker material needs more time to heat and cool, a longer tunnel the additional time needed. For additional information on bundling machinery, call to speak with one of our representatives. If you already know which products you are interest in, fill out our quote form and we will send a formal quote.